Note: this article references the v2 dashboard. If yours look different, upgrade today! Churn Buster largely operates behind the scenes, taking place as interactions between your subscribers, their card-issuing banks, and your payment processor. This is the "heavy lifting" that ensures your company can grow without the passive churn of paying customers. Each of these common use cases will be addressed in the following sections. Whenever you see a "?" by the metrics, hovering your cursor will give you a definition. In this article we'll go beyond definitions and break down what these metrics mean for your business. 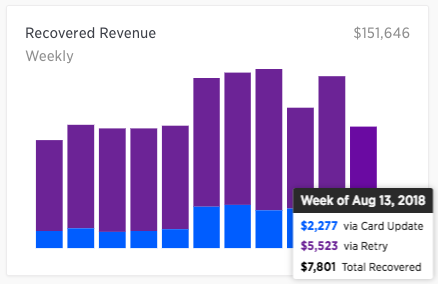 Specifically, we'll look at metrics featured on your Dashboard page. Starting with the current opportunity section at top-of-page, there are two high-level metrics on display. This shows the number of subscriptions that have failed a payment attempt, and are actively in a recovery campaign. This is the total revenue value of all currently failing invoice payments. It follows the same rules as Active Campaigns. Revenue goes past due whenever the first attempt to charge a card fails. Revenue is no longer past due when that invoice has been paid. This metric will be lower, and more accurate than "at risk" metrics reported by other dunning providers, as it does not include anything predictive/speculative, like cards that may expire. With the development of card updater technology, over 50% of "pre-expiration" revenue isn't verifiably at-risk, as the charges will clear without an issue. Now let's dig into the Recovered Revenue chart. The "via Retry" metric shows resolved payments *without* an updated credit card. This is basically Stripe doing its thing with automatic retries—by default Churn Buster will only ask your customer for a card update after verifying this is necessary. This may seem like a small thing, but let's not trivialize the value: anytime you can resolve a payment without contacting your customer, it's a win. Note: fear of cancelation isn't a great reason to avoid your customers. However, asking someone to take needless action and pay you money is at the opposite end of the "delightful" spectrum. Add value instead, while retries do their thing fixing soft declines. The "via Card Update" metric shows card updates with successful payments once an email campaign has begun. When a customer updates their card, by default Churn Buster will look back 30 days to pay down unpaid invoices. This can be extended to 60 days, 90 days, or more. If you are leaving delinquent accounts active and still delivering value (rather than discontinuing service), this is a great option for collecting on multiple unpaid invoices. Will show you the value of Churn Buster compared to doing nothing at all for failed-payment followup. Since Churn Buster follows best practices with email timing—with campaigns launching after the retry period, and those metrics separate and visible—these updates are specifically customers who would have been otherwise lost. Won't show you the value of Churn Buster compared to another dunning system. Basic dunning systems begin emailing immediately when a first payment fails. Some are even sending a high volume of pre-expiration emails. This means more card updates than necessary, for charges that would have been resolved via less intrusive means. Will show the value of immediately collected revenue. This will be a more accurate figure if you are only recovering annual subscriptions, because a higher percentage of updated cards will fail again the following year. For quarterly and monthly subscriptions, recurring payments will play a much bigger role in the lifetime value of these updated cards. Finally, a quick overview of Email Deliverability. As mentioned before, emails are only sent following a retry period. By default this means the first emails sending on day 5, so if one of your customers has just recently failed a payment they won't get an email right away. Once email campaigns are launched, our top priority is GET TO THE INBOX. This is so critical, and all other optimizations are meaningless without showing up in front of your customer. Open rate is a great way to verify baseline deliverability. As a company that only deals with transactional email, our deliverability % on the whole is incredibly high. If your open rates are below ~30%, it may indicate a problem. Please get in touch with your account representative. Beyond checking for common problems, another thing you can do to increase email open rate (and trustworthiness) is updating your DKIM and SPF records. This allows Churn Buster to send on your behalf, and the emails are accepted more easily as authentic. When an email soft bounces (temporary delivery problems) there is still hope for a renewal, as with Churn Buster we'll be making several attempts to reach your customer. Hard bounces (bad email address/bad domain) are pretty much guaranteed churn. Unless you have a customer's phone number and plan to reach out to them personally, you're often left with no way to contact them. Typically you'll want to see the Bounced metric below 1%. Emails are being validated on the front end, to check for common misspellings like [email protected]. A recent contest or promotion may have brought in a high volume of bad email addresses. Email addresses are regularly being synced from your database to your payment processor. Alternatively, you can use our Customer Details API to send Churn Buster email addresses directly from your database (and add personalization to your emails). 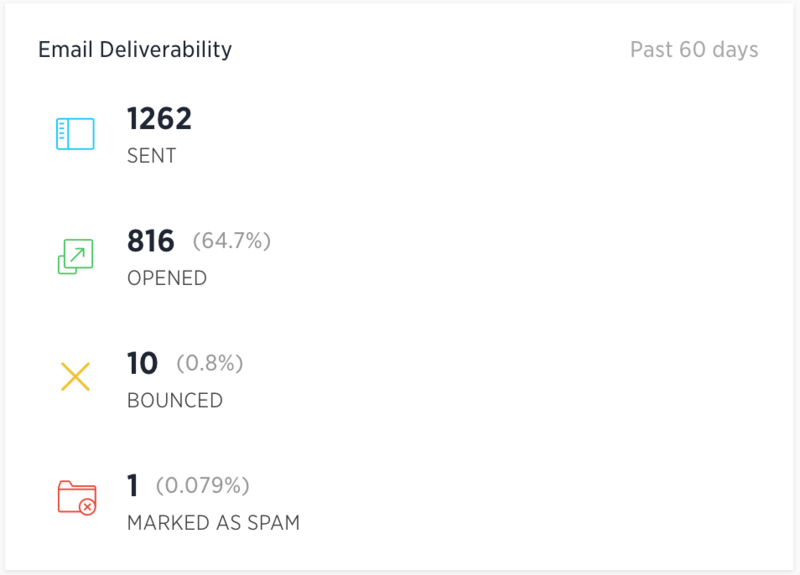 Churn Buster deliverability is incredible, largely because transactional email spam rate is incredibly low. If your spam rate is consistently above even 0.1% you may want to drill into the root cause. Getting to the inbox with an explicit subject line, a trustworthy email, and an easy card update process, gives us the best chance to retain a customer. Unlike a marketing email that is designed with persuasion in mind, dunning emails primarily need to be timely, visible, and low friction. You'll find the majority of your customer's motivation to renew comes from their history with your company, and the experience you provide. Want to provide an incentive for renewals? We can present a special offer in your campaign emails, passing coupons through your card update pages. We hope this guide helps make sense of the numbers in your dashboard! If you have lingering questions, don't hesitate to let us know.